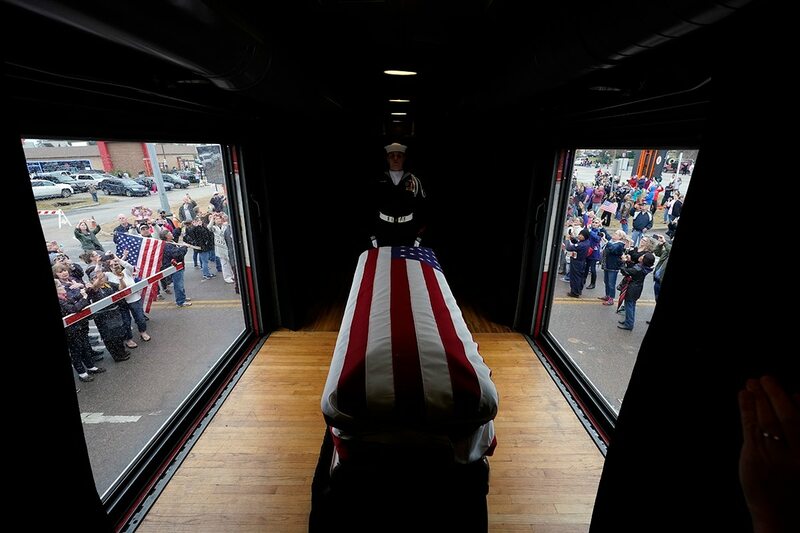 COLLEGE STATION, Texas — Thousands waved and cheered along the route as funeral train No. 4141 — for the 41st president — carried George H.W. Bush’s remains to their final resting place on Thursday, his last journey as a week of national remembrance took on a decidedly personal feel in an emotional home state farewell. Some people laid coins along the tracks that wound through small town Texas so a 420,000-pound locomotive pulling the nation's first funeral train in nearly half a century could crunch them into souvenirs. Others snapped pictures or crowded for views so close that police helicopters overhead had to warn them back. Elementary students hoisted a banner simply reading "THANK YOU." The scenes reminiscent of a bygone era followed the more somber tone of a funeral service at a Houston church, where Bush's former secretary of state and confidant for decades, James Baker, addressed him as "jefe," Spanish for "boss." At times choking back tears, Baker praised Bush as "a beautiful human being" who had "the courage of a warrior. But when the time came for prudence, he maintained the greater courage of a peacemaker." Baker also offered Bush as a contrast to today's divisive, sometimes vitriolic politics, saying that his "wish for a kinder, gentler nation was not a cynical political slogan. It came honest and unguarded from his soul." "The world became a better place because George Bush occupied the White House for four years," said Baker. As the post-funeral motorcade carrying Bush's remains later sped down a closed highway from the church to the train station, construction workers on all levels of an unfinished building paused to watch. A man sitting on a Ferris wheel near the aquarium waved. Bush's body was later loaded onto a special train fitted with clear sides so people could catch a glimpse of the casket as it rumbled by. 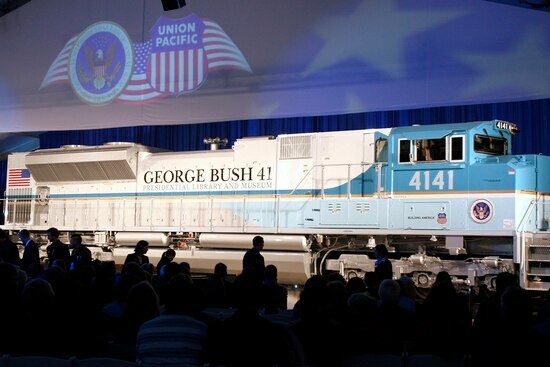 The train traveled about 70 miles — the first presidential funeral train journey since Dwight D. Eisenhower's remains went from Washington to his native Kansas 49 years ago — to the family plot on the grounds of Bush's presidential library at Texas A&M University. Bush's final resting place is alongside his wife, Barbara, and Robin Bush, the daughter they lost to leukemia at age 3. In the town of Pinehurst, 55-year-old Doug Allen left eight coins on the tracks before the train passed — three quarters, three dimes and two pennies. The train left the coins flattened and slightly discolored. "It's something we'll always keep," Allen said. Andy Gordon, 38, took his 6-year-old daughter, Addison, out of school so she and her 3-year-old sister, Ashtyn, could see the train pass. "Hopefully, my children will remember the significance and the meaning of today," Gordon said. Addison was carrying two small American flags in her hand. 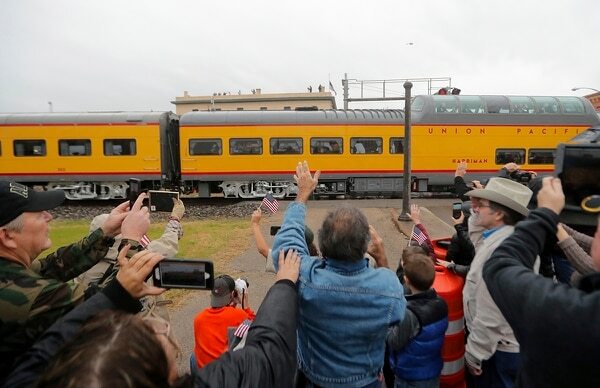 The train arrived in College Station in the late afternoon with a military band playing "Hail to the Chief" and then Texas A&M's "Aggie War Hymn." 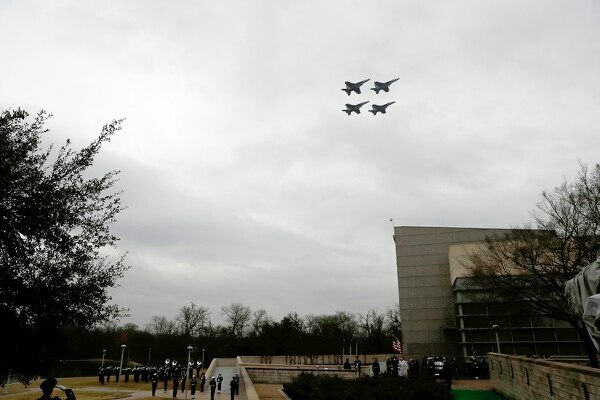 About 2,100 cadets in their tan dress uniforms with jackets and ties and knee-high boots waited for hours on a cold, gray day to line the road — known as Barbara Bush Drive — to the Bush library’s front doors. The U.S. Navy conducted a 21 strike fighter flyover, a salute to the World War II Navy pilot, followed by a 21-gun cannon salute on the ground. At the earlier service at Houston's St. Martin's Episcopal Church, where Bush and his family regularly worshipped, the choir sang "This is My Country," which was also sung at Bush's presidential inauguration in 1989. Those gathered heard a prayer stressing the importance of service and selflessness that the president himself offered for the country at the start of his term. There were rousing renditions of the "Battle Hymn of the Republic" and "Onward Christian Soldiers," and also performances from some of Bush's country favorites. The Oak Ridge Boys recalled playing for him for decades — sometimes at the White House — and joked that Bush "fancied himself to be a good bass singer. He was not." They then sang "Amazing Grace," and Reba McEntire offered a musical version of "The Lord's Prayer." Remember that time the former president invited WWE wrestler Ric Flair to join him on Air Force One? Grandson George P. Bush, the only member of the political dynasty still holding elected office, as Texas land commissioner, used his eulogy to praise the man the younger generations called "gampy." "He left a simple, yet profound legacy to his children, to his grandchildren and to his country: service," George P. Bush said. The church's pastor, the Rev. Russell Levenson Jr., recalled the Bushes often attending services and offering to give up their seats to others on days when the church was particularly crowded. "He was ready for heaven, and heaven was ready for him," Levenson said of Bush who was in declining health in recent years. The minister suggested that when the former president died, he met his wife of 73 years in heaven and Barbara Bush playfully demanded, "What took you so long?" Indeed, the funeral occurred at the same church where services were held in April for Barbara Bush. Those are remembered for an emotional scene when the former president gazed from his wheelchair up at her casket, then shook hands with well-wishers. 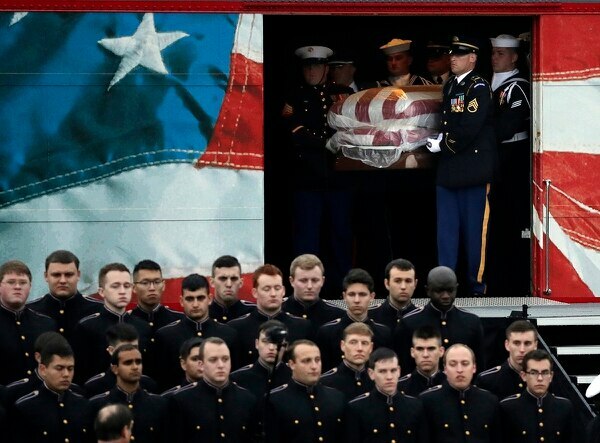 Wednesday night, more than 11,000 people paid their respects as Bush lay in repose at the church all night. President Trump, who once mocked the late president's "points of light" call to volunteerism, had nothing but favorable words Thursday. "He was a wonderful man. We will always remember this great statesman and beloved American patriot," Trump said. "He really was very special." The former commander-in-chief was also a World War II combat pilot who earned the Distinguished Flying Cross. The cathedral service in Washington was a tribute to the patriarch of one of the nation's most powerful political families — they occupied the White House for a dozen years — and to a faded political era that prized military service and public responsibility. Like Baker's address Thursday, it included indirect comparisons to Trump but was not consumed by them, as speakers focused on Bush's public life and character — with plenty of cracks about his goofy side, too. "He was a man of such great humility," said Alan Simpson, former Republican senator from Wyoming. Those who travel "the high road of humility in Washington, D.C.," he added pointedly, "are not bothered by heavy traffic." Trump sat Wednesday with his wife, the trio of ex-presidents and their wives, several of them sharp critics of his presidency and one of them, Hillary Clinton, his 2016 Democratic foe. Apart from courteous nods and some handshakes, there was little interaction between Trump and the others. George W. Bush broke down briefly at the end of his eulogy while invoking the daughter his parents lost and his mother. He took comfort in knowing "Dad is hugging Robin and holding Mom's hand again." Associated Press writer David J. Phillip contributed to this report.